For small business owners, crowdfunding is an alternative form of finding investment. It works differently to other sources of funding where you approach a single individual or organisation – such as a bank – to get the funds you need. A crowdfunded investment involves lots of individual investors committing small amounts of money. When all these small amounts of money are put together, they make up the required total investment. The best way to get a crowdfunded investment for your business is to use a crowdfunding platform as they offer an existing base of users. Usually, this base of users won’t be enough to make your crowdfunding efforts a success, but they are a start. They are also a source of investment that you might otherwise not have access too. Plus, they will be familiar with the crowdfunding concept and will be willing to commit money when the right investment comes along. 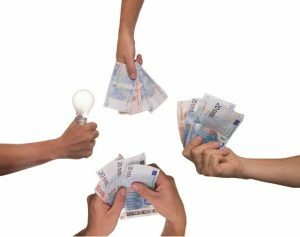 Reward-based – companies using this method of crowdfunding make a pitch to investors, offering something in return for the investment. This could be merchandise, products, special editions, special access, etc. Equity – this is where you offer investors unlisted shares in your company. Credit-based – this works like a loan you get from a bank. However, instead of one institution (the bank) giving you the loan, you get the money from multiple smaller investors. Donation – this type of funding sometimes involves rewards for committing money, but not always. Given the fact that individuals offer money for no return, there is usually a social or charitable element to the project or organisation they are donating to. Most crowdfunding platforms work on the basis of a target. In other words, you must specify a target amount of money before you launch your campaign. If you get enough pledges to meet the target, the investors pay and you get the pledged amount of money (minus the crowdfunding platform’s fees, of course). If the pledges you receive do not meet the target by the deadline, nobody pays, and you get nothing. As a result, crowdfunding can be seen as a way to test or assess the viability of your idea in addition to being a potential source of funding. Reputation considerations – there are a number of aspects to this, including your appearance on the platform in the first place. Might customers and others view it negatively? There are also significant expectations from investors if your crowdfunding campaign is successful. If it meets delays or runs into problems, the reputation of your company might become damaged. Finally, by putting your idea onto a crowdfunding platform before you’re ready to bring it to the wider market (i.e. before it’s fully developed and tested), you are leaving your company open to public criticism of your plans, idea, or business. As with all financial issues, you should get professional advice before progressing with a crowdfunding campaign. Call Gilroy Gannon today. Posted in Start up, Startup Business, Tips and tagged Crowfunding.